Why has it been so cold lately? Yet another month has come and gone, and for most of us across the Prairies, March 2018 was not one we really care to remember. After a warm start to 2018, which saw January temperatures running 1 to 3 C above the long-term average across all three Prairie provinces, the cold weather moved in for February and has never really left. After seeing temperatures in February running 3 to 7 C below the long-term average, most of us were hoping March would be a little kinder. At times March was kinder, and it looked as though the cold snap that began in February might finally come to an end, but Mother Nature had other ideas. 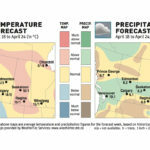 Starting in the west, Alberta saw the coldest temperatures in March, at least compared to average, with all three of the main locations (Calgary, Edmonton, Peace River) reporting mean monthly temperatures about 3.5 C below the long-term average. Things were only slightly better in Saskatchewan, with Saskatoon reporting a mean monthly temperature 3.2 C below the long-term average and Regina coming in 3.4 C below average. As we continue east into Manitoba things were a little better. Both the Brandon and Dauphin regions saw mean monthly temperatures about 1 C below average. Winnipeg was the warm spot, compared to average, with a reading that was 0.3 C below average. Looking at the actual temperatures, Calgary was the warmest spot in March, with a mean monthly temperature of -5.1 C; Peace River was the cold spot with a temperature of -9.1 C.
Along with the cold weather came plenty of snow, especially in Alberta. All three of the main locations in Alberta saw between 25 and 35 cm of snow during the month, around 10-15 cm above average. Saskatchewan saw near-average amounts of snow, with 20 cm reported in Regina and 15 cm in Saskatoon. Across Manitoba the Brandon region was the snowiest, with nearly 40 cm of snow reported, about 15 cm above average. The Dauphin and Winnipeg regions missed out on much of this snow, with both locations coming in slightly below average. Overall, across the Prairies March was much colder than average, with near- to above-average amounts of precipitation. Looking back at the different forecasts, it looks like none were correct. 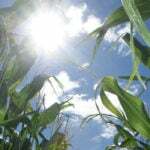 NOAA and the Canadian Farmers’ Almanac were the only forecasts that called for above-average amounts of precipitation, but they missed out on the temperatures, as did all the other forecasts. So, with not a great track record, let’s see what the current medium- to long-range forecasts predict for the rest of April. According to Environment Canada, we will see below-average temperatures along with near-average amounts of precipitation. Both NOAA and the CFS models also call for below-average temperatures along with near-average amounts of precipitation in most regions, but above-average amounts in southern Alberta. The Old Farmer’s Almanac calls for slightly below-average temperatures and well-above-average amounts of precipitation. The Canadian Farmers’ Almanac seems to predict near-average temperatures and precipitation as it mentions fair several times along with the odd shower, and only mentions stormy conditions once. Finally, my kick at the weather cat. With the current cold snap looking to stay firmly in place until at least the middle of April it is pretty much a shoo-in that April will see below-average temperatures. As for precipitation, with signs that the main storm track will start to shift northward, it looks like April will end up seeing above-average amounts of precipitation. The worst part is that a cold and wet April usually means a snowy April. On the bright side, nearly all of the long-range weather models point toward a shift in late April to a much warmer pattern that will lead to well-above-average temperatures in May. To wrap up this article I wanted to take a quick look back to see just how the whole extended winter season turned out, weather-wise, across the Prairies. I call it the extended winter season, since winter is usually defined as being the months of December, January and February, but for those of us in the Prairies we know winter is more like November to March. After crunching all of the numbers for the major centres across the Prairies, winter temperatures ran between 0.9 and 2.1 C below average. The warmest region, compared to average, was across Manitoba, with the coldest regions being across southern Saskatchewan and Alberta. Precipitation was more varied, with southern Manitoba seeing well-below-average amounts. 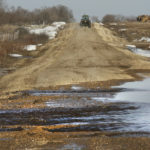 The Winnipeg region was the driest spot, coming in at about 55 mm of water-equivalent precipitation below the long-term average. Saskatchewan was also drier than average, with Regina reporting a deficit of about 30 mm and Saskatoon a deficit of 12.5 mm. 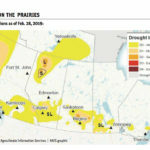 In Alberta it was north versus south, with the Edmonton and Peace River regions seeing near-average amounts of precipitation, leaving Calgary as the Prairie wet spot. It recorded nearly 140 mm of precipitation, about 75 mm above average. Overall, it was a colder-than-average winter across the Prairies, and drier than average across central and eastern regions, with near-average amounts in the west, with the exception of the southwest, which was notably wetter than average.